I go through phases with my hair. I wear it in a certain way for months and years then switch and wear it another way for ages. When I was 18 I used to wear my hair all pinned back with curls at the sides, when I was 17 it was a emo fringe and a side ponytail. 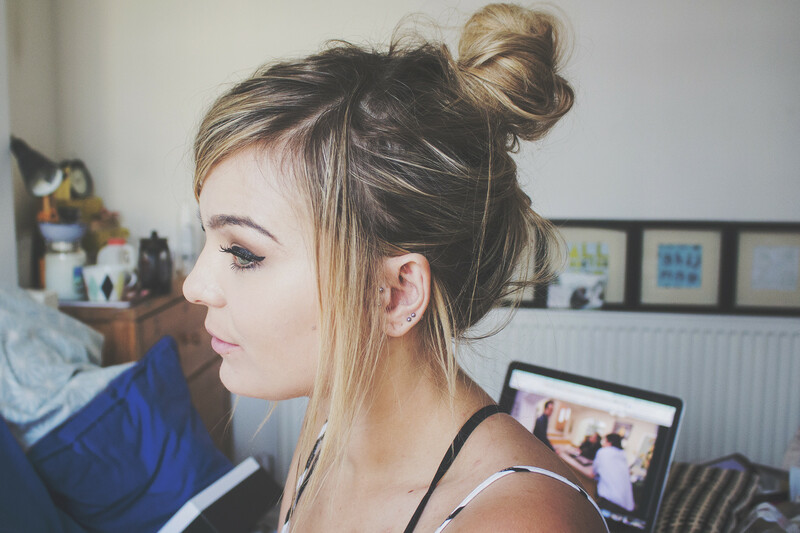 Now at the grand ol' age of 24 - This messy lil' bun has become top dog. I keep getting asked how I go about doing it and all I do is section of the front of my hair (fringe) then pull it back into a ponytail and then into a mussed up bun. I really like it because it shows off my ear piercings and keeps my hair off my face. Sorry there isnt more of an explanation than that. I've always found it to be a "throw up and play with it until it looks alright" type of hair do! PS. Yeap I'm watching Arrested Development in the background. BEES?